Time. Now Available Without Compromise. The Olio Model One combines modern design with timeless style to help you manage your digital life. Our Fourth Batch is Sold Out. Sign up to be the first to know about upcoming batches. a pretty sprightly hop in the right direction. There’s a lot of thoughtfulness that’s gone into many aspects of these time pieces. 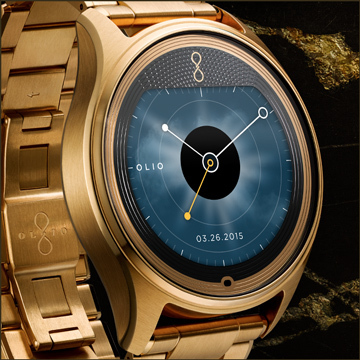 Olio Devices… is redefining the face of the watch. It’s not every day I’m impressed by a smartwatch. Olio is different. Upon closer inspection you'll see an item that looks and feels … like a traditional watch. The solid steel case is milled and polished and has a welcome heft to it. 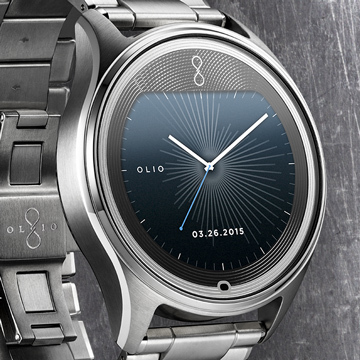 Meet the Olio Model One, a stunning metal smartwatch that is just as much a watch as it is smart. Its high-end Olio watch is a solid-looking piece of machinery. Both of these watches … are flat-out gorgeous, with a pleasingly simple interface… and some unique features. not just any old watch, but a stylish fashion statement. Olio (whose case is waterproof for swimming) is thoroughly a luxury product. 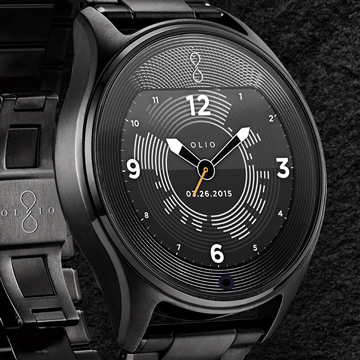 Apple Watch may be the popular play, alongside Pebble, but… Olio is already setting the pace for smartwatch design. it looks gorgeous with amazing attention to detail and a … deep understanding of what has been missing in the smartwatch space thus far. The luxury materials, bespoke UIs for each collection and limited edition releases… of the Model One so far speaks to Olio's understanding of fashion as self expression. Sets a whole new tone. As polished as you are. Be the first to hear about new styles, the latest features, and more. Join and get $100 off your first order. Enjoy 40% off an Olio Model One today using HOLIDAY40 during checkout. Join our mailing list and we'll let you know when we're starting new batches, running promotions, and other exciting news. Don’t worry, we’re already working on our next batch. Sign up below and we’ll let you know when they’re ready. © Copyright 2016. All rights reserved, Olio Devices, Inc.